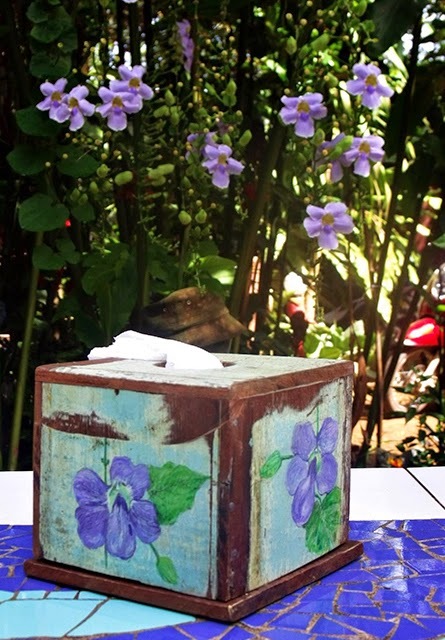 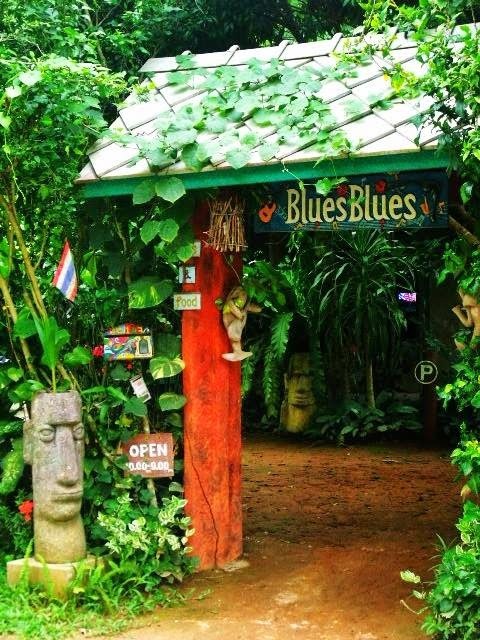 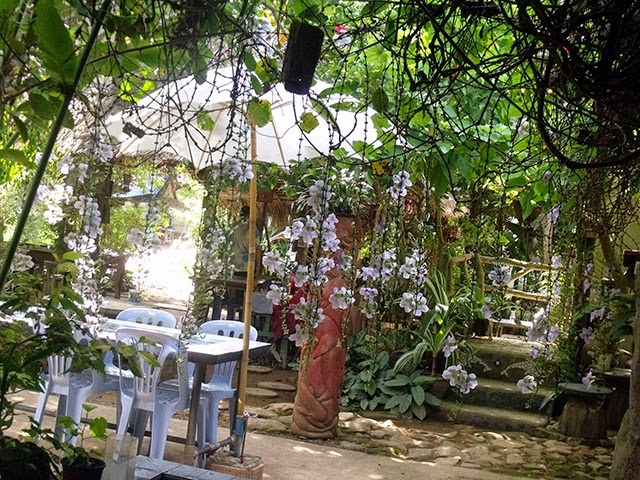 If you are looking for an authentic Thai restaurant in an original and peaceful garden, then Blues Blues Arts & Food is made for you. 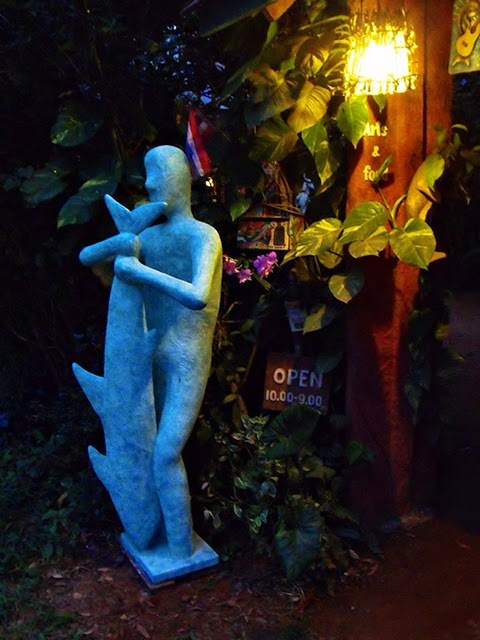 This place is unique, it's a mixture of a restaurant, an art gallery and a natural park with soft Blues and Jazz music. 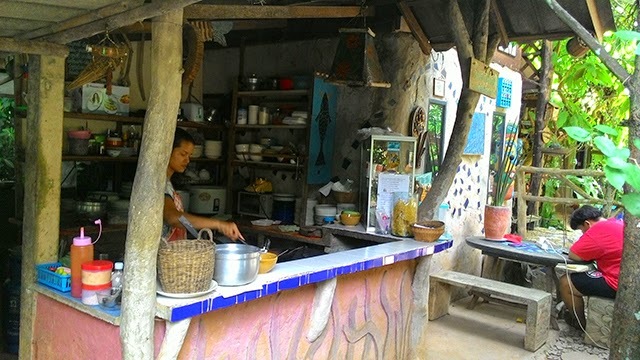 Mr. Paitoon, also called "Auu" and his wife Pee'Taew, called "Taew" are the happy and lovely owners of this special restaurant which is opened daily from 10.00am to 9.00pm. 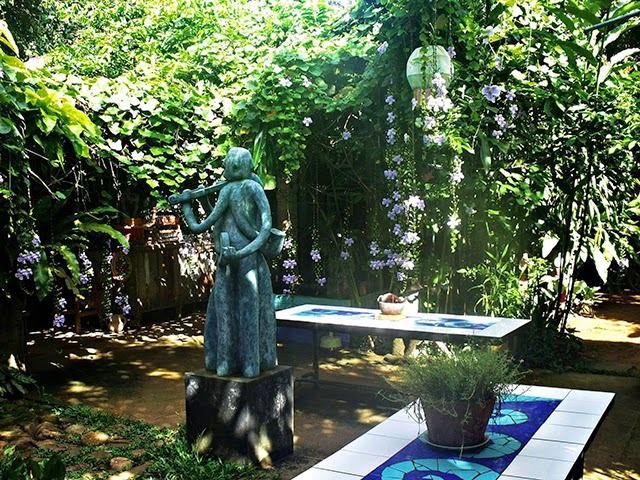 You can stop-by to have a meal, a drink or just enjoy their garden! 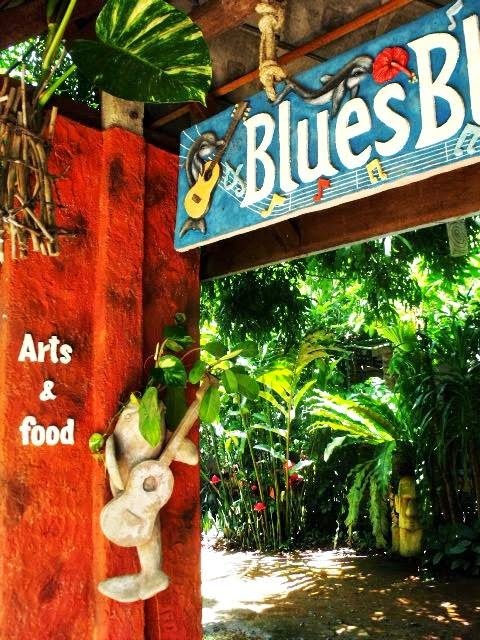 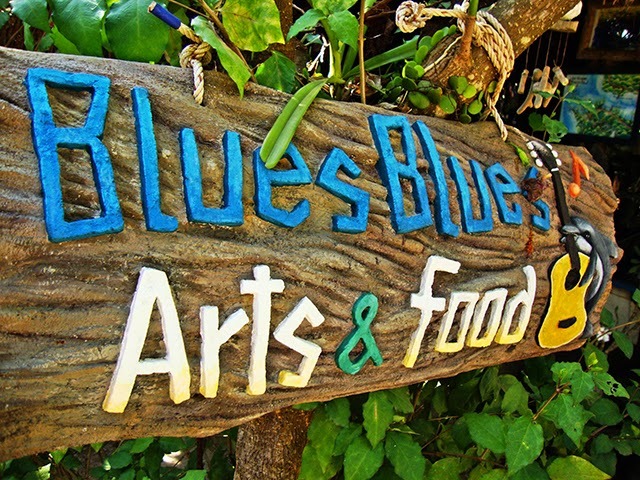 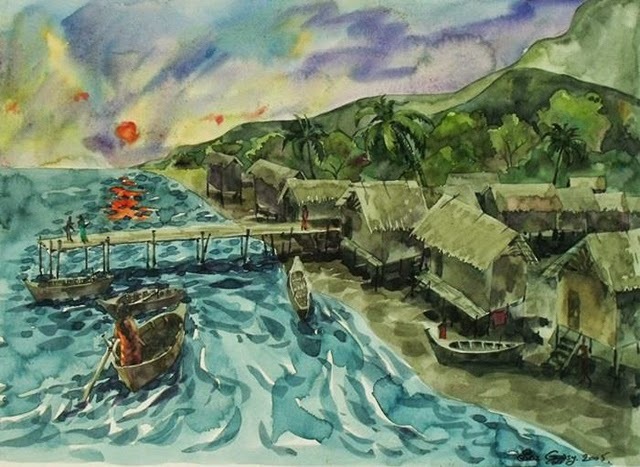 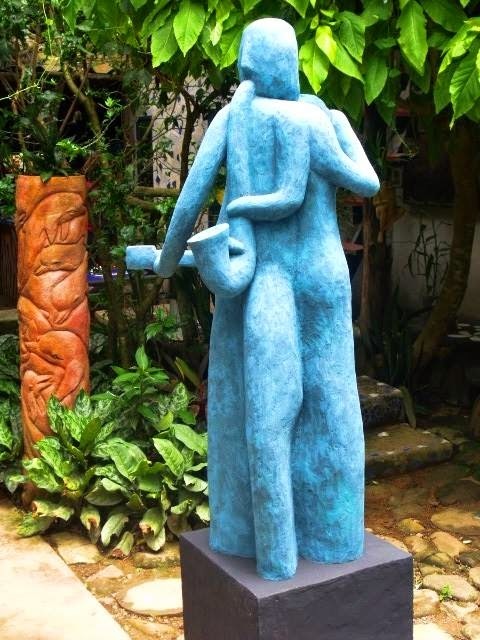 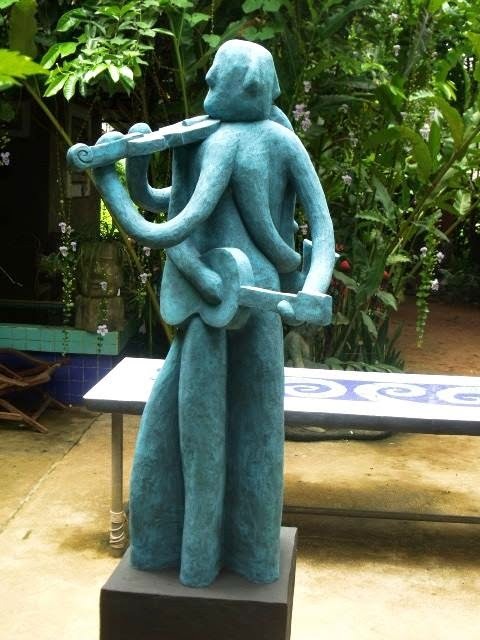 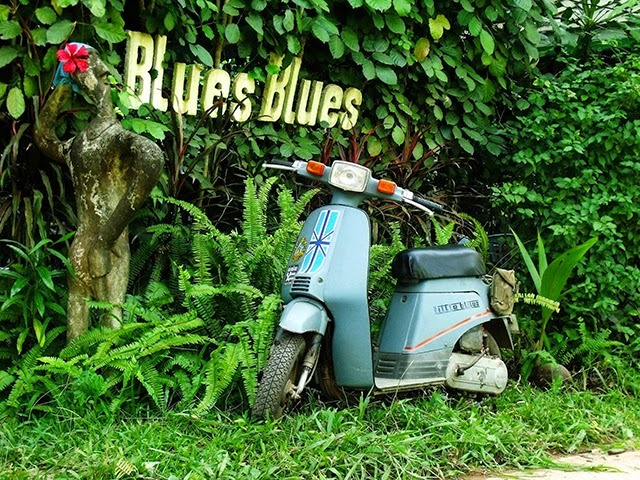 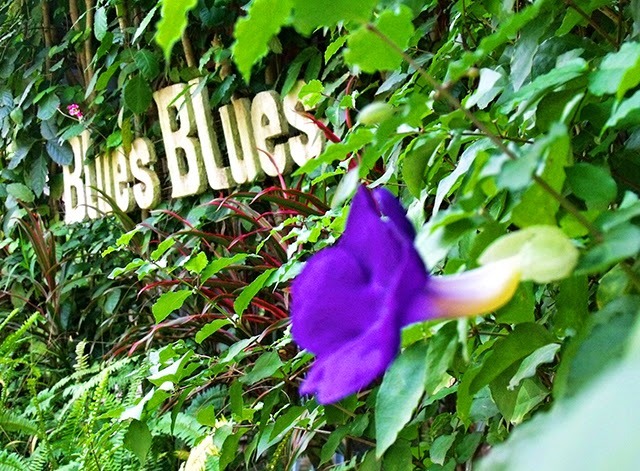 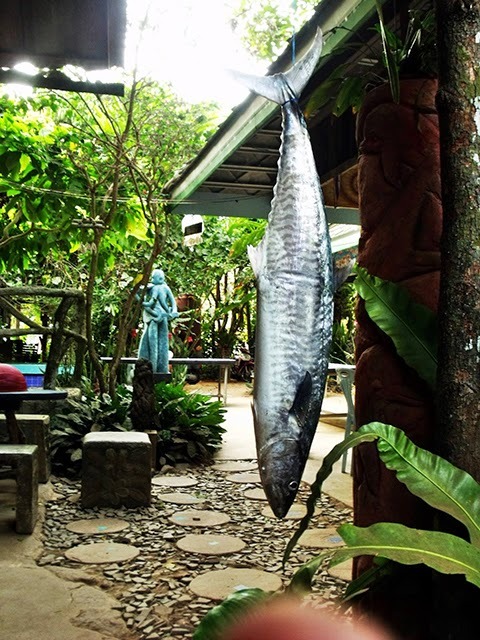 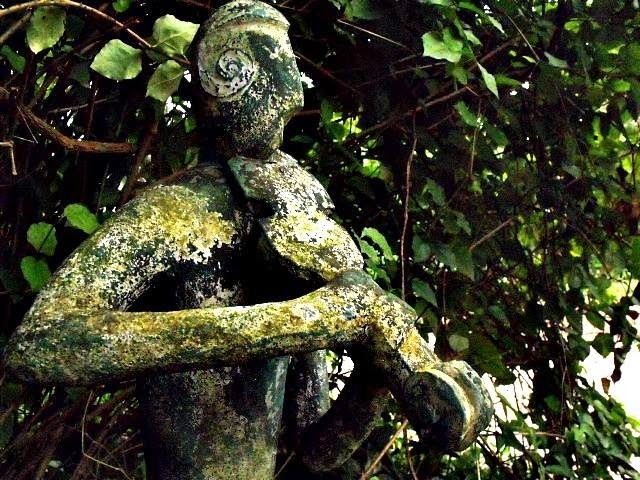 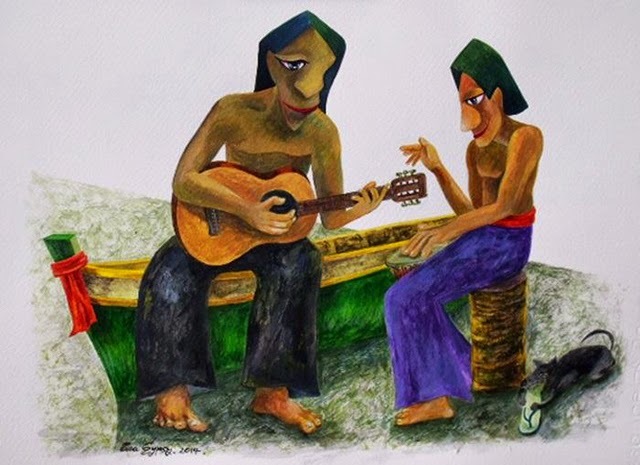 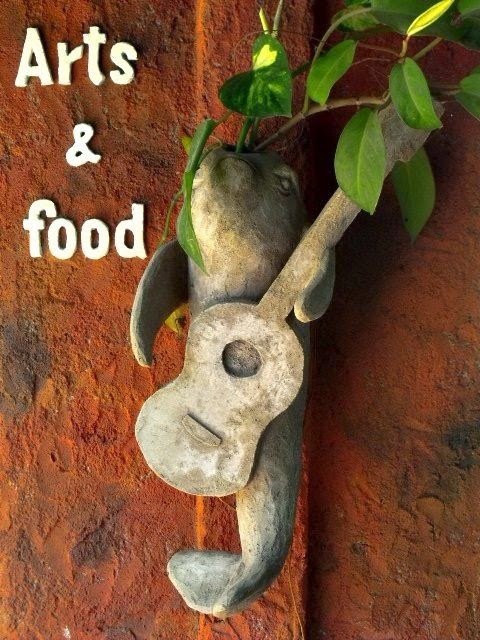 Blues Blues Arts & Food is located on the north part of Koh Chang, in Klong Son. 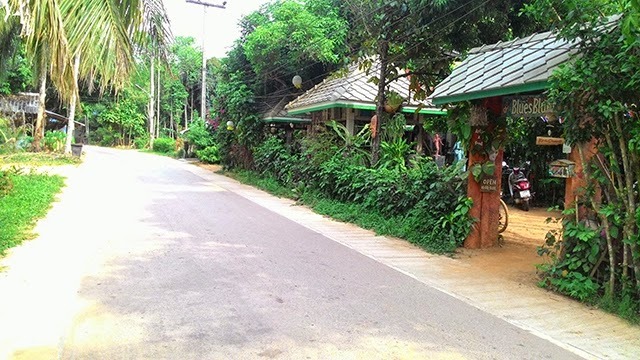 From the main road, it's at about 600 meters from the 7/11 superlarket which is at Klong Son cross, to the direction of Baan Kwan Chang elephant camp. 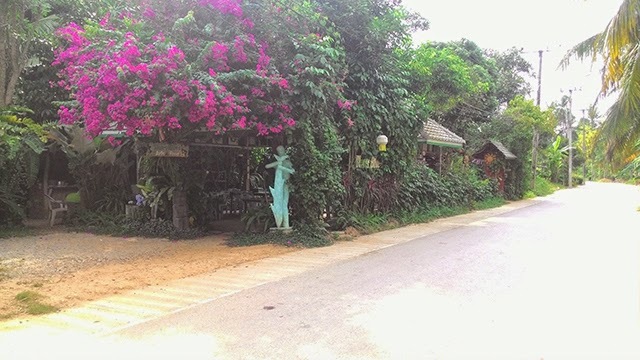 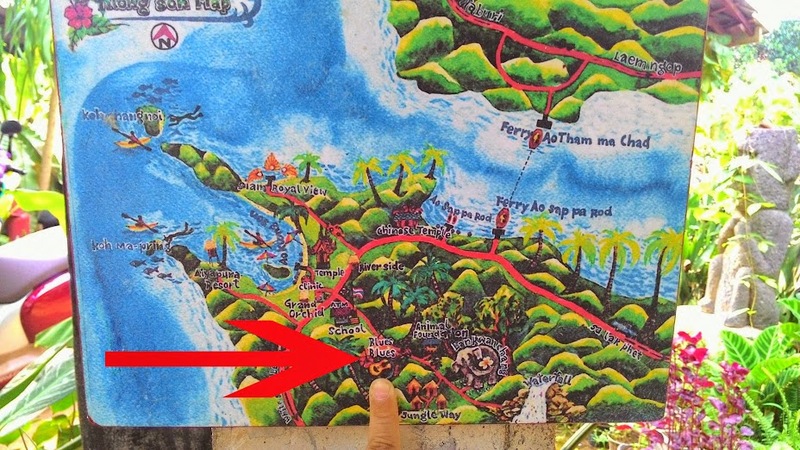 If you come from White Sand beach, turn right at the 7/11 cross, pass the local school, then the bridge over the canal and it's 150 meters on the right. 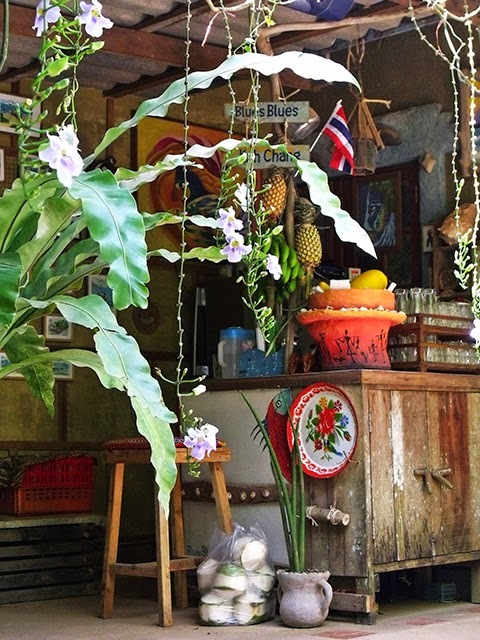 This is a relatively cheap place where you can eat very good traditional Thai food. 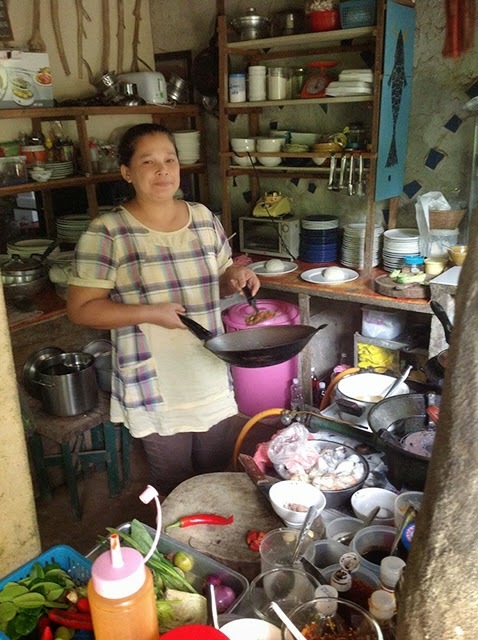 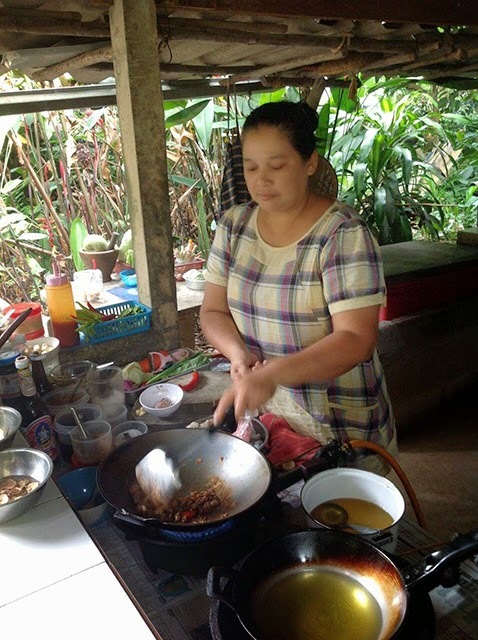 Taew is an excellent cook, using only fresh and natural products and sometimes helped by her youngest son. 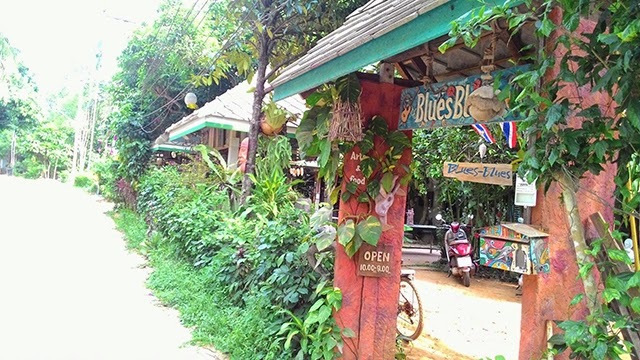 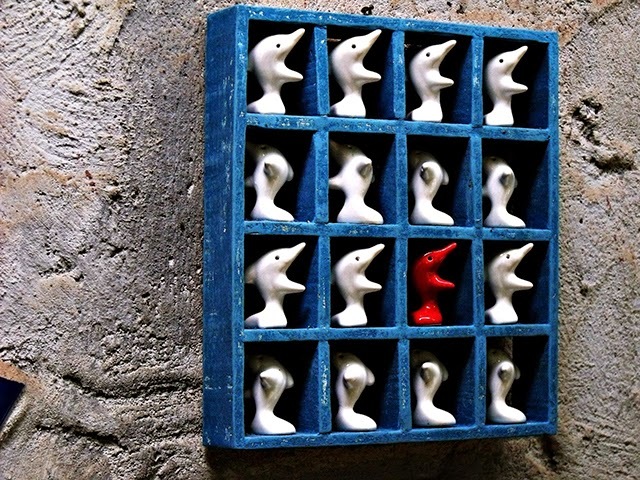 This restaurant is not only for your mouth and stomach but also for your eyes and your ears. 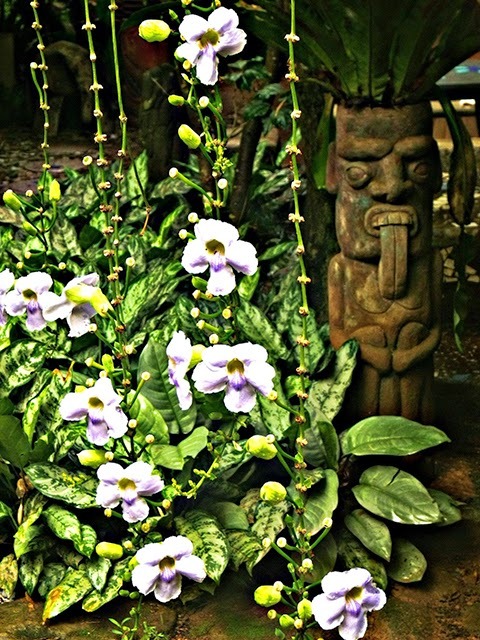 There are lots of beautiful flowers and each part of the garden has been decorated by Auu's own art. 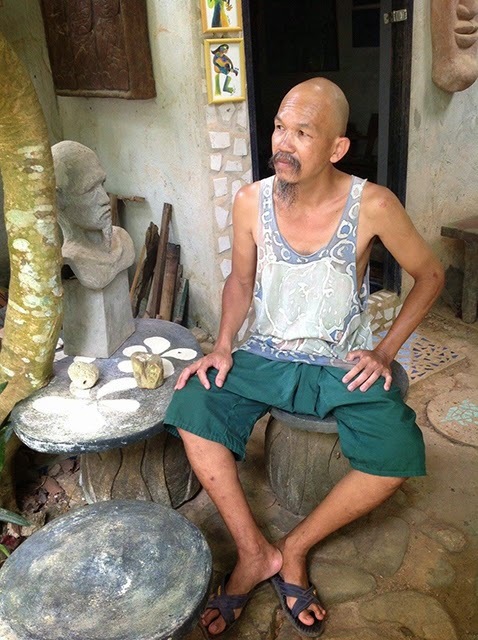 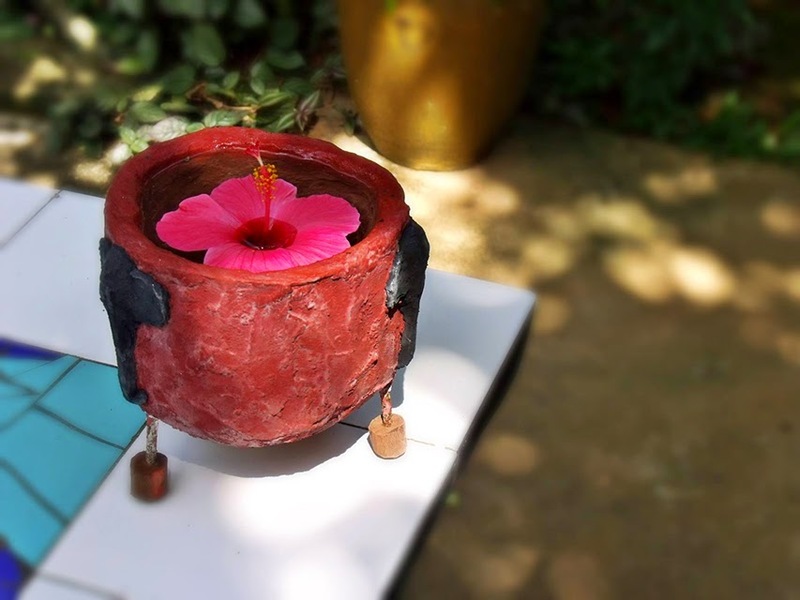 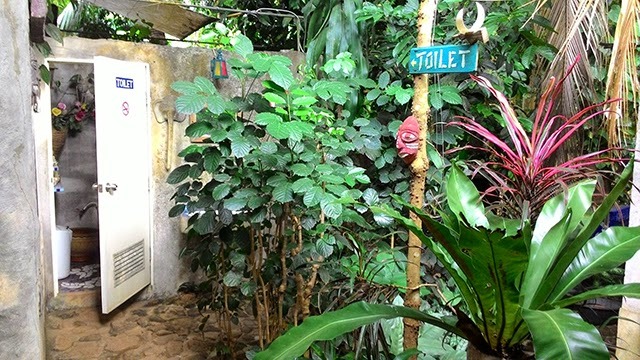 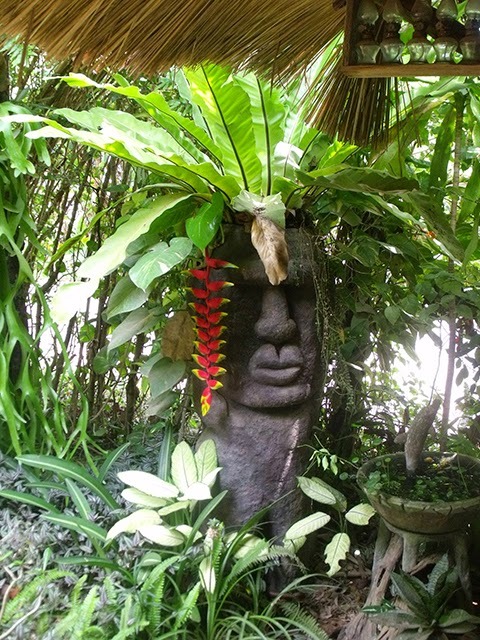 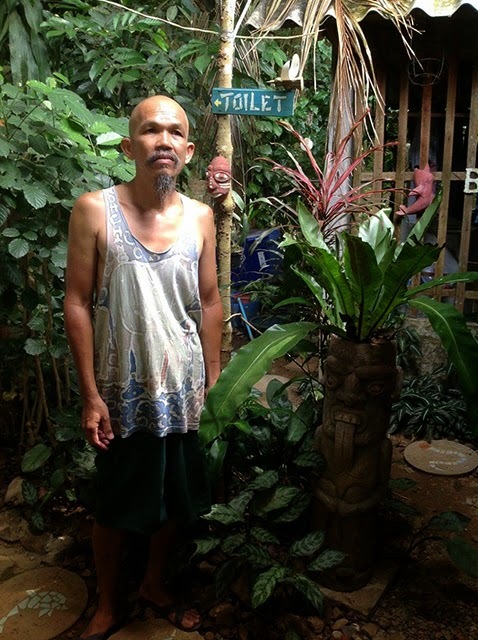 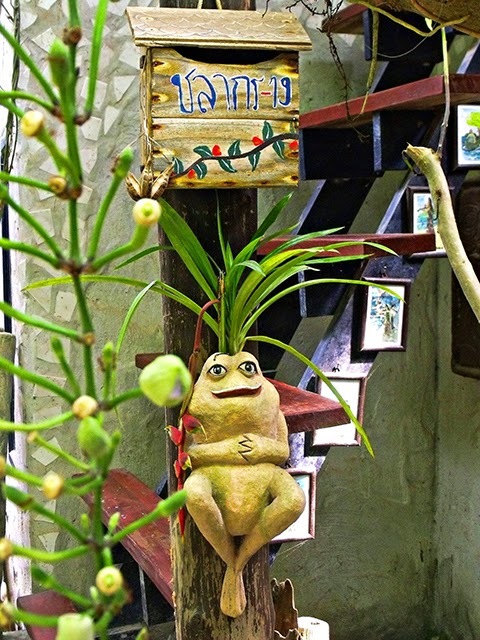 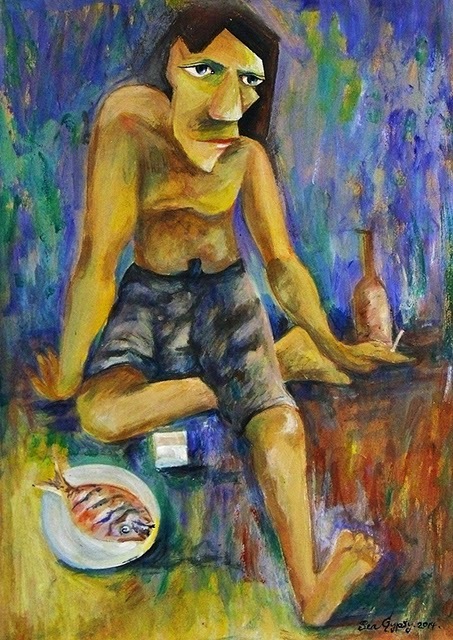 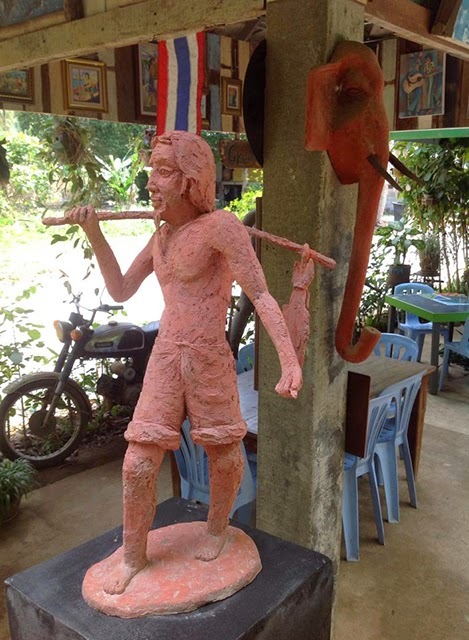 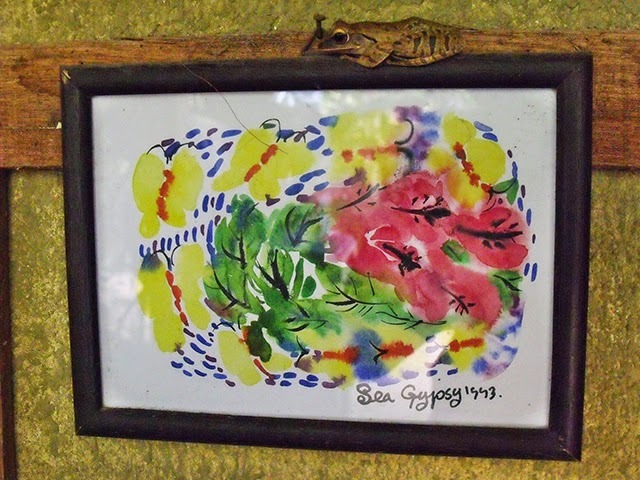 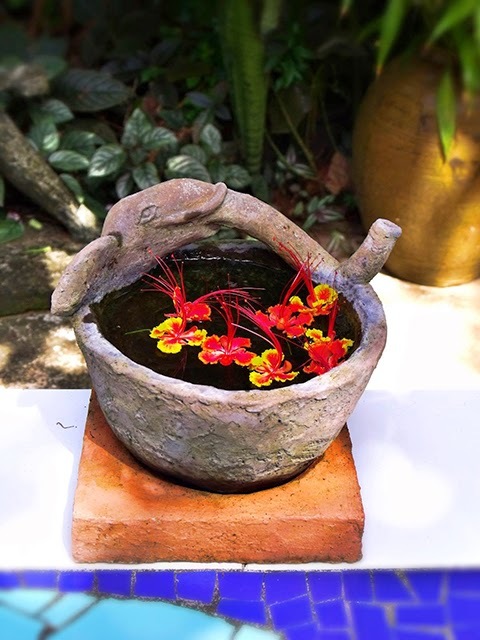 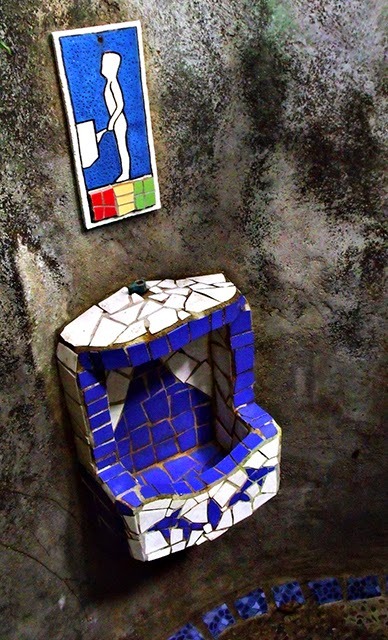 Auu is an artist with his own style, he has decorated all the restaurant and garden, up to the toilet. 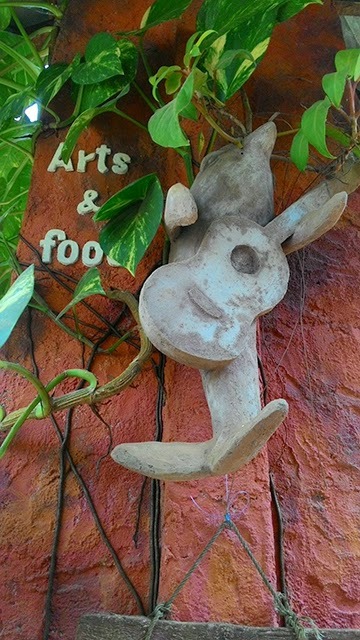 You have to see it to understand what I mean when I write that it's a unique place. 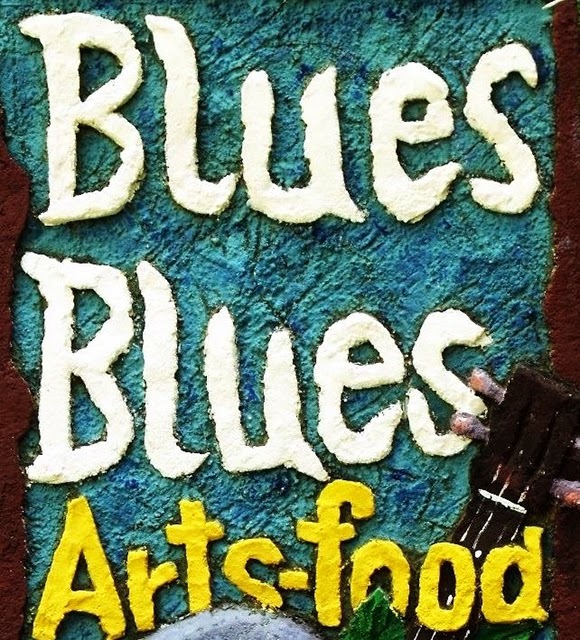 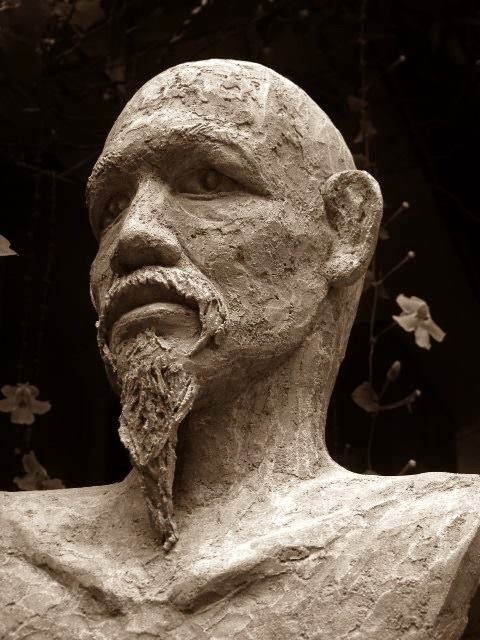 Some of the sculptures and paintings can even be purchased if you want to bring a part of Blues Blues Arts & Food in your home. 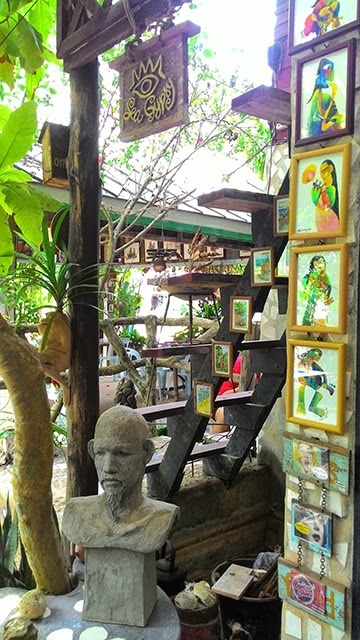 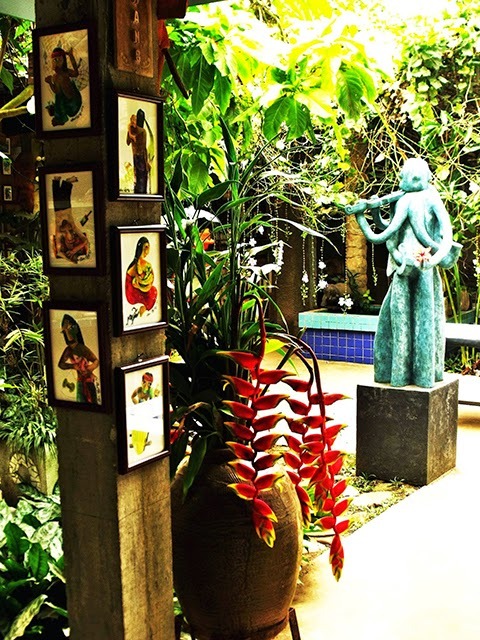 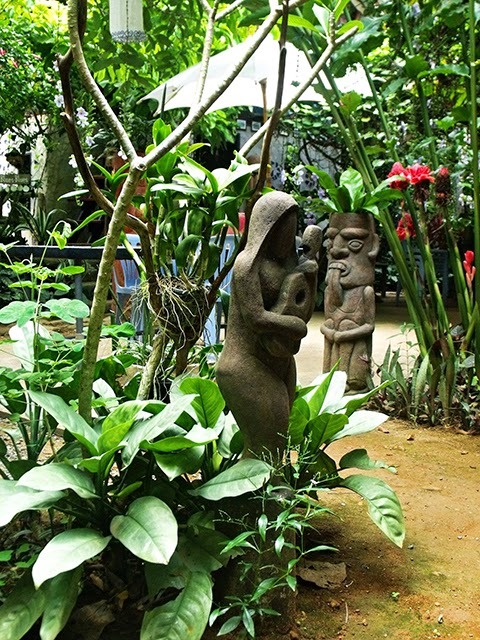 This Thai restaurant but also outdoor modern art gallery is peaceful and friendly but is also very close to the nature. 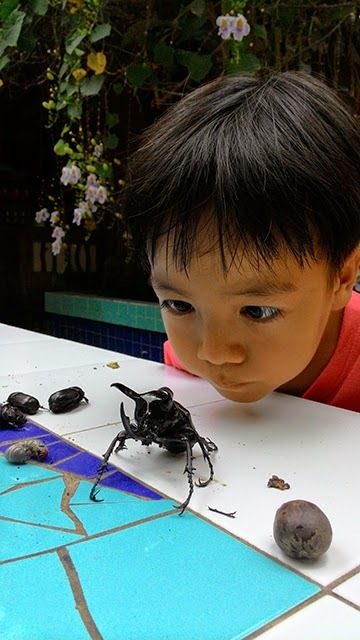 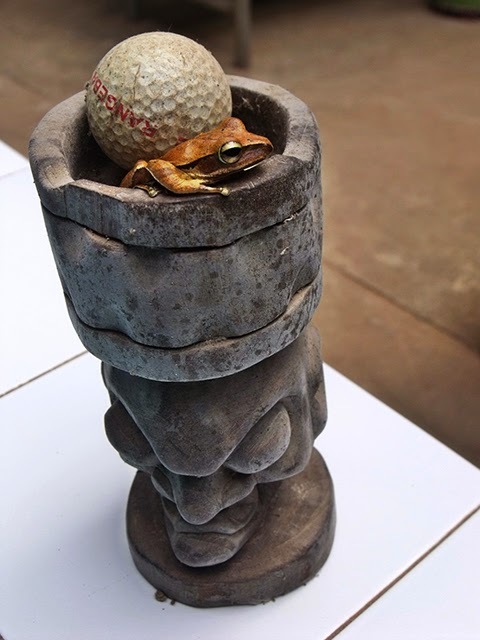 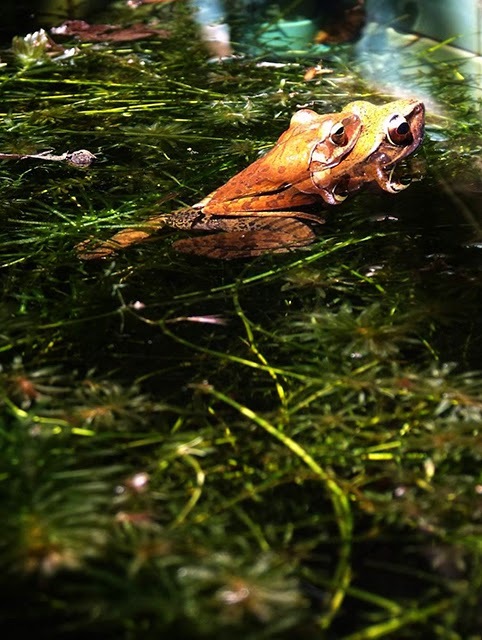 Auu can show you in an interesting and educative way the different insects and animals which are living in the garden like the frogs, spiders, ants, bugs and so on. 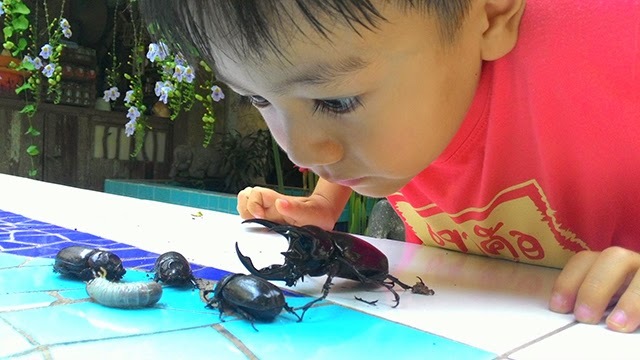 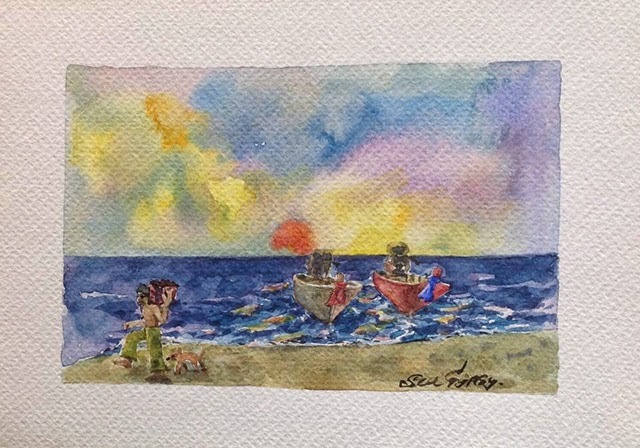 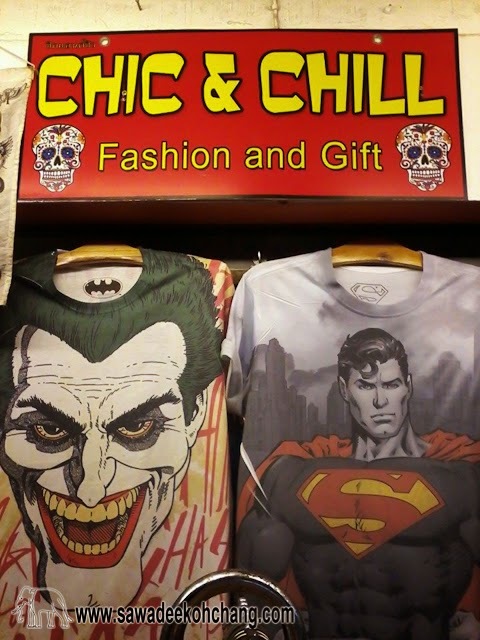 Not only the adults will like it, but also children!